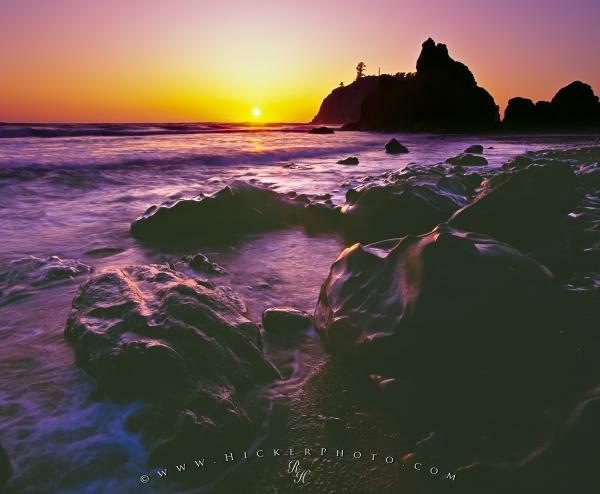 The beautiful but rugged Ruby Beach is accessed by the northwestern most point of Highway 101 on the Olympic Peninsula, and is a stunning spot for sunset photography. Ruby Beach is situated in the Kalaloch area of the Olympic National Park, an area which offers a sampler of the variety of coastal habitat protected under the umbrella of the national park, from sandy beaches to rocky headlands. Ruby Beach is perfect for viewing a vibrant coastal sunset, the kind the Olympic Peninsula is famous for. Sunset along Ruby Beach in Olympic National Park, Olympic Peninsula, Washington, USA. Photo of Ruby Beach during sunset on the Olympic Peninsula in Washington State, USA. Pictures from photo gallery "Washington Pictures"
This picture is part of the photo album "Washington Pictures" - there are more beautiful images waiting for you.